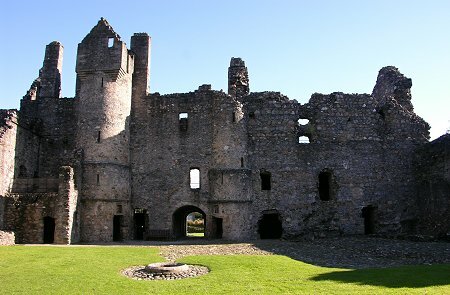 Balvenie Castle lies on the northern edge of Dufftown. 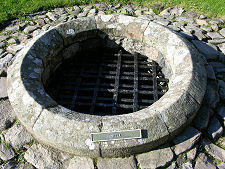 It dates to the 1200s when Marjory, daughter of Fergus, the last Celtic Earl of Buchan, married William Comyn, one of the new breed of Scottish noblemen. He became the new earl and also Lord of Balvenie. 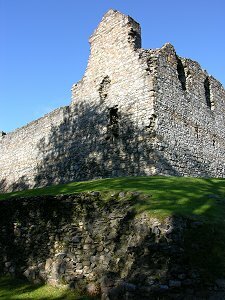 It was either William or his son, Alexander, who built Balvenie Castle in Glen Fiddich. The Comyns fell foul of Robert the Bruce's regal ambitions and until the early 1400s the fate of Balvenie is unclear. It then re-emerged in the hands of the Black Douglases, a formidable baronial family. But they too were wiped out, by King James II in 1455. He then gave Balvenie to one of his own kinsmen. Such were the risks and rewards of power politics in medieval Scotland. 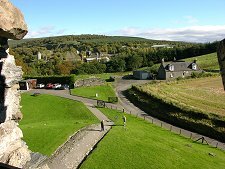 The castle under Stewart ownership became established as a place of gracious living and in 1550 the Earl of Atholl incorporated an elegant renaissance house into the structure. Mary Queen of Scots was a guest here in September 1562. This is hardly a mark of distinction: there can be few large Scottish structures standing in the mid 1500s in which she does not seem to have spent a night or two. Sadly, Balvenie Castle failed to stand the test of time and the changing needs and fashions of the day. A new house, Balvenie New House, was built half a mile to the north and by 1720 the castle was abandoned and had already started to fall into decay. Ironically, Balvenie Castle has outlasted its successor. By the late 1800s Balvenie New House was itself standing empty, and in 1892 William Grant built his Balvenie Distillery around it, to add to the Glenfiddich Distillery he built immediately to the north of the castle in 1887. The house was demolished as part of an expansion of Balvenie Distillery in 1920. To the modern visitor Balvenie still offers a fascinating insight into life in Glen Fiddich so many hundreds of years ago. And there is more remaining than you expect. Perhaps because it is so hidden by woodland, the interior is very much larger than seems possible from the outside. 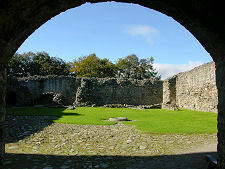 The curtain wall is mainly from the 1200s whilst the main entrance into the courtyard is the product of remodelling by the then Earl of Atholl in the 1500s. 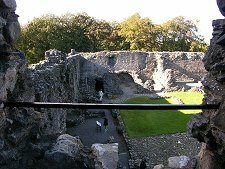 The west range contained a hall and great chamber over vaulted storage cellars. 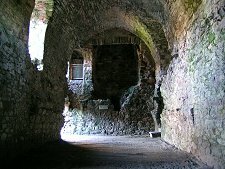 Little remains here except the vaulting of the cellars, but it is thought that this particular building was constructed in the 1400s as residence for the Douglases. 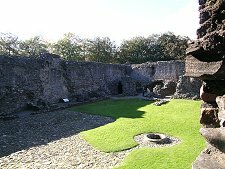 Also built in the 1400s was the kitchen range, situated against the south curtain wall next to the brewhouse. It is still possible to make out traces of the great fireplaces and see the original stone sink amongst the ruins. 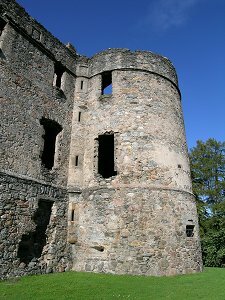 Incorporation of an early renaissance house known as the the Atholl Lodging within the castle structure in the mid 1500s led to the destruction of parts of the earlier curtain wall. 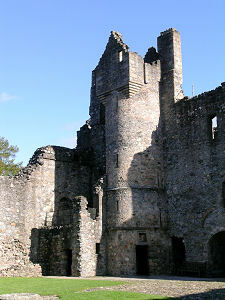 The remains of a great round tower, three storeys and an attic high, can be seen at the north-east corner. The ground floor rooms provided accommodation for some of the Earl's household, whilst the first floor was the Earl's own apartment. This comprised three main rooms: a hall, outer chamber and inner chamber. On the second floor, an apartment of similar plan may have been used by the Countess. The south end of this range also contained a two-storey kitchen complex which was has possibly been remodelled prior to the building of the Atholl Lodging. Balvenie stands as an interesting example of a building which evolved to meet the demands of different people and different times. 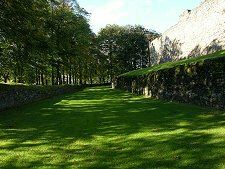 In its earliest form, it was heavily fortified, with thick walls, a wide ditch and defensive towers. In the time of the Douglases, it was a place to live as well as a stronghold and its development was complicated and hampered by the increasing difficulty of doing both well. By the 1500s the demands for a more sophisticated domestic life led to the building of the Atholl Lodging: before this, too, failed to match up to the demands of still more genteel 1700s life. In the end it proved easier to build elsewhere rather than continue to try to adapt the castle. 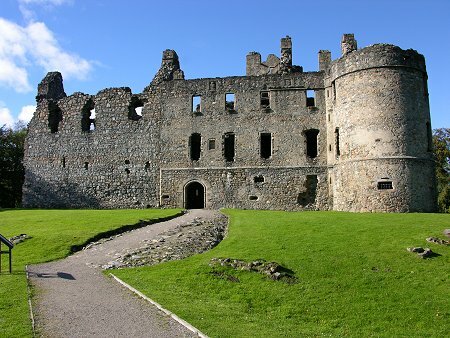 From its strategically significant position in the glen, Balvenie Castle allowed the immensely powerful Comyn earls to rule over the entire area for more than a century. Though there were no famous sieges or notable battles here, this would have appeared a striking fortification to anyone approaching it for the first time: as it still is today.